This is the first of two Montserrat Senior Exhibitions that will be hosted by the Gallery at Porter Mill. DÉRIVE features work by Alyssa Coffin, Ariel Durkee, Corynn Larkin, and Markie Remien. DÉRIVE- (n.) (French) lit. "drift"; a spontaneous journey where the traveler leaves their life behind for a time to let the spirit of the landscape and architecture attract and move them. Our work touches upon the theme of personal narrative spaces. Some people find themselves lost in reality, while others become lost in their own mind; collectively, we hope to provide a place for viewers to think and reflect. We want to explore the use of narrative environments to form the juxtaposition of confronting reality and escaping it; of construction and deconstruction, and the tension formed by the use of line, whether it be text, wire, charcoal, or string. Ariel Durkee is exploring the fictional world she has created known as Ismenara. Through writing and visual art, she hopes to pull viewers into a space, and propose a discussion on what it means to use, alter, and connect with flora and fauna. Alyssa Coffin’s work addresses ideas involving personal life narratives, deconstructing to reveal and the hand written word as an expression of these stories. She will be creating an installation of a dissected “book” with pages composed of transparent sheets of overlaying handwriting that the viewer can walk between. Collage paintings illustrating more specific narratives and identities will hang on the walls surrounding the central installation. Corynn Larkin, explores the transformation of ordinary man-made materials into forms that convey and embody organic growth and change. There is a linear component as well as an intuitive physicality to her forms by using wire for a structural drawing element. 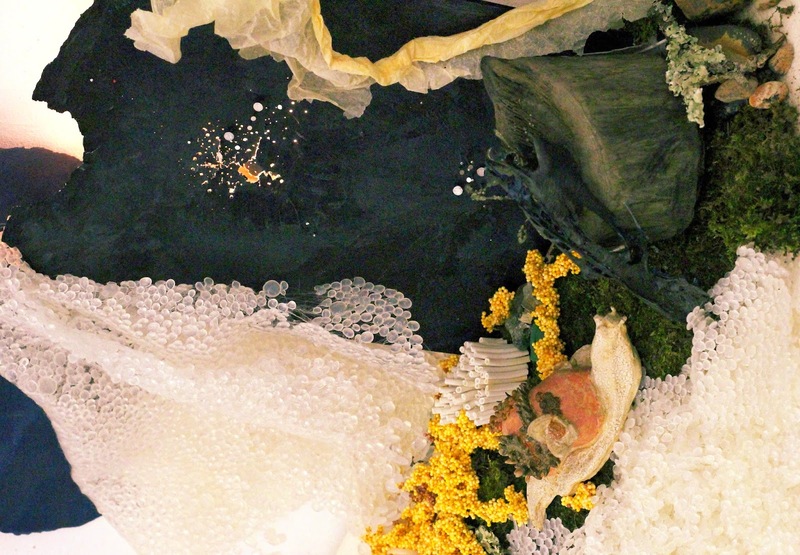 She combines materials to create versions of biomorphic abstractions. Markie Remien is creating a utopia and dystopia installation. Extracting from her own dreams, experiences, and personal emotions, she is welcoming you to see a glimpse of a microcosm suspended in time. She is inspired by the natural world and the spiritual connection that you can find within the ecology of this planet. Our work relates both aesthetically and conceptually. It connects through a muted color palette, reference to natural forms, and the use of text and language. While differences in our art create contrasts, the similarities evoke a sense of place, whether that be a mind space or an alternate reality.